In pursuit of wild salad greens, we looked at three wild greens that are delicious salad plants last week. This week I offer you three more salad fixin's, including my dear old friend, shy violet. And there will be three more two weeks after that. 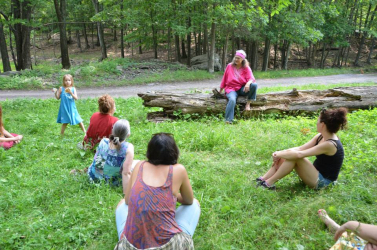 In between, we're going to get out of the gardens and into the forest to check in with some beautiful flowering (and medicinal) plants out in the deep woods. I hope you'll come along. Plants near the road thrive in the presence of the high levels of carbon monoxide, which cuts down on oxidative stress, helping them be healthier and better medicine. So, yes, I do harvest near the road if that is where the best plants are growing. Some, like coltsfoot and mullein (herbs that help the lungs) positively thrive in roadside ditches and road cuts. Others, like shy woodland ginseng and skullcap, wouldn't be caught dead growing beside the road, indeed! Few things give me as much joy as buttering a piece of whole wheat toast and taking it out into the woods, picking violets as I walk, until my toast is covered with them – purple, white, and yellow – and then breakfasting on it. Welcome May! Welcome fairies! Welcome bare feet! The showy flowers of the violets are not the reproductive flowers, which come later and are green and hidden under the leaves. So pick violets to your heart's content. Decorate your salads with them. Make violet honey. Flirt with the violet fairies. Rosemary Gladstar and I talk about violet honey in our teleseminar. And you will enjoy the YouTube of the apprentices and I making violet honey. Shall we go on a walk in the woods on this delicious day? The sun is warm and the trees are in blossom and not yet leafed out. It's the perfect time to find and enjoy the native wildflowers of the deciduous forest, which tend to bloom while they are still bathed with sunlight, before the emerging tree leaves plunge them into shade. 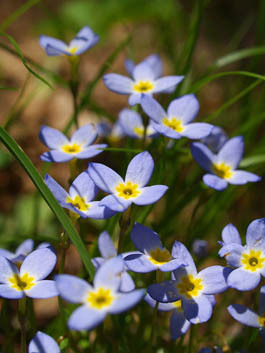 Our first wildflower reflects the sun and the sky: It's light-blue with a yellow eye at its center. I call it "Quaker ladies," an alternative to the usual field guide name of "bluet" (Houstonia caerulea). [photo 1] It's said to be a headache remedy. Hmmm. I guess if you sent the kids out to harvest several hundred of these little flowers – and they are so abundant you could harvest hundreds of them – you'd at least get an hour of peace and quiet to resolve your headache. Or perhaps she will wear a red and yellow party dress of wild columbine (Aquliegia canadensis). [photo 7] They are here, at the edge of, and across the face of, this cliff. And, this lovely plant, growing in a crack in the rock, is early saxifrage (Saxifraga virginiensis), [photo 8] the rock breaker, one of seventeen species in my area according to Peterson's. Over there, beside the trail, is trailing arbutus (Epigaea repens). [photo 9] I can't take you to see it and I don't know if I even dare to take a picture. It's so shy, it sometimes dies if you look directly at it. Really. I thought it was a tall tale until I saw it happen. When it flowers, the fragrance is sensational, so I lie next to it, with my eyes closed, reveling in the scent. Down this path there are more yellow lilies springing up from the damp ground. They are heralded by strange leaves that are mottled like a trout, thus the name trout lilies (Erythronium americanum). [photo 10] Their perfect tiny yellow flowers are used by fairies as caps or skirts, I'm sure. And here, almost hidden by the leaves, is a famous plant that used to be used to help the liver, round-leaved hepatica (Hepatica americana). 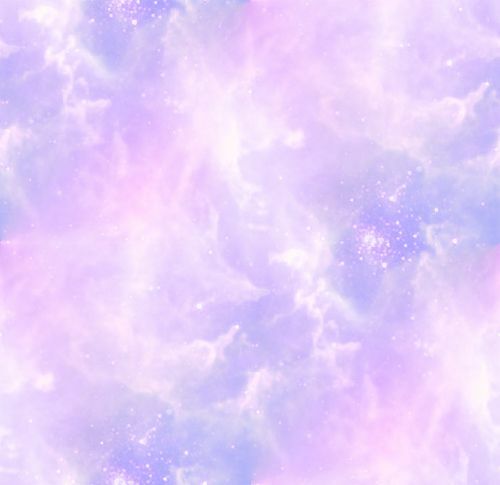 [photo 11] The flowers come in amazing shades of purple, blue, pink, and white. There's no reason to disturb a relatively-rare native perennial, since there are so many abundant, common plants, like dandelion, that help the liver.